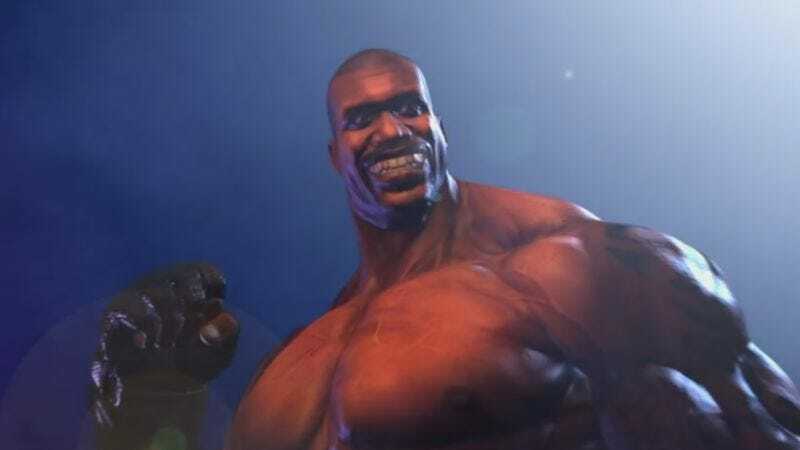 In what should be remembered as the moment the retro-game revival movement reached its absolute low, Shaquille O’Neal, the former genie and NBA star, and a new video game studio have launched an Indiegogo campaign to help fund and gauge interest in the creation of a new Shaq Fu game. The original Shaq Fu, released by EA in 1994, is a one-on-one fighting game in the Street Fighter style. The premise: Shaq stumbles into another dimension and has to defeat the evil mummy Sett-Ra, who was in no way a ripoff of Mumm-Ra. Since then, the game has deservedly gained a reputation as one of the worst ever made, which is not lost on Shaq and the developers behind this reincarnation. They spend approximately 70 percent of their campaign materials reassuring potential backers that they know the old game was crap and won’t let it happen again. The team behind the campaign, a new studio called Big Deez Productions, is looking for $450,000, and since it is being run through Indiegogo instead of Kickstater, they’ll receive any funds raised regardless of whether that goal is reached. They have raised more than $15,700 at press time. Why do they need the money if both Shaq and the developers will, as they say on the campaign page, be investing a lot of their own time and money into the project? “The purpose of bringing the game to the public is to see how much interest there is in becoming Shaq’s partner and in seeing the game happen. In exchange for your help, Shaq is offering unprecedented access to his life.” And how much will that access cost you? Well, if all you want is for the man to follow you on Instagram, that’ll cost $500. But lunch and a game of basketball at his place? That’s $15,000. Lunch with Shaq and an invitation to watch a live taping of NBA On TNT? That’ll run you $35,000. Forcing Shaq to revisit his role of a lifetime for your Kickstarter-bound unofficial Kazaam sequel? Sadly, that’s not yet part of the unprecedented access on offer. But you never know!